Technological advancement has seen the introduction of different varieties of paint spray guns on the market, each better suited for a different function. The High Volume Low pressure spray guns, for instance, are better suited for completing small-scale and detailed painting projects. If on the other hand, you want to cover a vast surface or area, an airless sprayer will serve you better. The growing preference for paint spray guns is largely due to their portability, convenience, and usefulness compared to the more traditional methods like brushes and rollers. Their innovative design allows you to complete your project in a safe, hassle-free, clean and quick fashion. Plus, they are lightweight and compact and do not contribute to significant hand fatigue like the traditional alternatives. Unfortunately, your search for the best and most suitable paint spray gun will most likely be complicated by the fact that the market is full to the brim with all sorts of paint spray guns from manufacturers from all over the globe, all promising you reliable and exceptional performance. While most of them are readily available on the market and you can easily purchase one by simply clicking a button, they haven’t been reviewed yet, leaving you to gauge their performance by just looking at them. Another challenge is the vast differences and variations among sprayers in terms of features and characteristics, all of which further complicate the search process. Unless you’re a seasoned painter with a deep understanding of features of the sprayers and the factors to consider, you’ll need a little professional assistance. Luckily, we’ve put together this product guide to assist you in finding that ideal paint spray gun. The HomeRight C800766 is our first pick primarily because of its use of ease and high-performance, making it possible for novices and enthusiastic Do-It-Yourselfers learn their way around paint spray guns. The HomeRight C800766 simplifies the entire process, making it less daunting and if you're just starting out, you'll be surprised by its directness and ease of operation. The first step the HomeRight brand took in ensuring simplicity and ease of use is eliminating the need for an external air compressor, known all over the world for complicating the painting process in addition to making it dangerous. With one of the most daunting and complicated parts out of the way, the procedure for getting started is a lot simpler, taking a matter of minutes and doesn’t require any experience or prior knowledge with paint spray guns. The next steps for getting the sprayer ready would be filling the paint cup that comes with the spray gun, attaching the spray gun to a compatible wall outlet and lastly plugging the entire system into an ordinary wall outlet. That's it. From here onwards, all you will be doing is squeezing the trigger, and the machine's internal motor will automatically create the air pressure required for smoothly spraying the paint. Unlike its more complex counterparts, you don't have to attach any extra components to it. From here the paint spray gun works like a charm. Contrary to widespread expectations, the HomeRight C800766 comes with the essential features in addition to a bunch of others aimed at making your work easy and more comfortable, especially if you'll be spraying for longer every day. To begin with, the paint spray gun has an adjustable nozzle that allows you to change the spray patters to three different configurations – circular, vertical, and horizontal- enabling you to cover a targeted area with ease efficiently. You also have precision controls for directing the paint to the exact point you want it. Coupled with the brass housing of the HomeRight C800766, you have a machine you'll be comfortably using on a wide variety of surfaces at a level of precision a majority of other paint spray guns just cannot emulate. Consequently, the likelihood of making minor but noticeable errors is significantly reduced and with a little experience and expertise, eliminated. At its price and with its features and specs, it is ideal for light-duty spraying projects around the house and maybe occasionally on the work site. With its three spray patterns, the spray gun is a perfect choice for those looking to paint furniture, cabinets, chairs and other woodworks. A major highlight of the unit is the quality of its work. The even application of the paint spray gun's shade plus the fact that it's very lustrous makes it a first and last resort for most enthusiastic DIYers and novices all around the world. The gun is additionally very versatile and uses different types of paints without any performance issues. 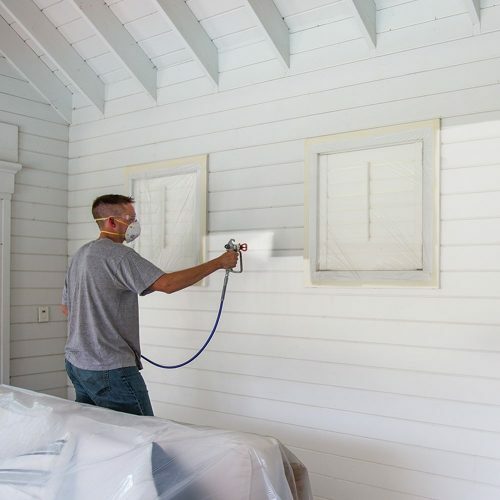 The sprayer can use lacquer, thick and thin paint varieties, and even chalkboard paint. The finish is so excellent it rivals that of most showrooms. The HomeRight C800766 features a robust and rugged construction so that it can easily stand up to heavy-duty use and all sorts of environments you expose it. Taking proper care of it and maintaining it regularly in accordance with the manufacturer’s instructions will help you extend its useful life a little longer, all the while providing you with dependable and uninterrupted service. In all, this sprayer is one of the high-performing, easy to use and versatile paint spray guns worth investing in. The machine has a sturdy construction and will last for a significant period, especially given that it's made from high-quality plastics. It provides exceptional results and is compatible with a multitude of paints including lacquer and chalkboard paint. However, the HomeRight C800766 is only ideal for light-duty painting projects. 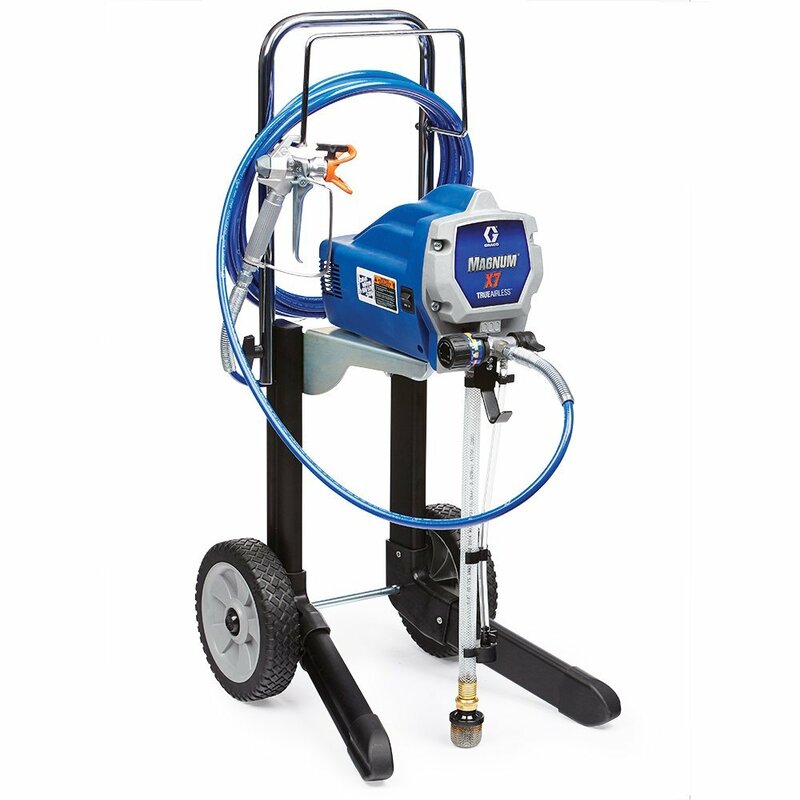 The Graco Magnum 262800 X5 paint gun is just one of a handful of paint spray guns fitted with a full trigger and in-handle filter, which completely overshadow the fact that it's a stand sprayer. With these features, the stand sprayer is capable of more than just spraying paint onto different surfaces. First, the package comes with all the additional tools and accessories needed, so you have an ample time setting it up and getting it ready to spray. Two of the most essential accessories come with are the SG2 and the 0.15 max tip size that gives it the unprecedented ability to spray different types of paints from containers with capacities as small as just 1-gallon to those with a 5-gallon capacity. 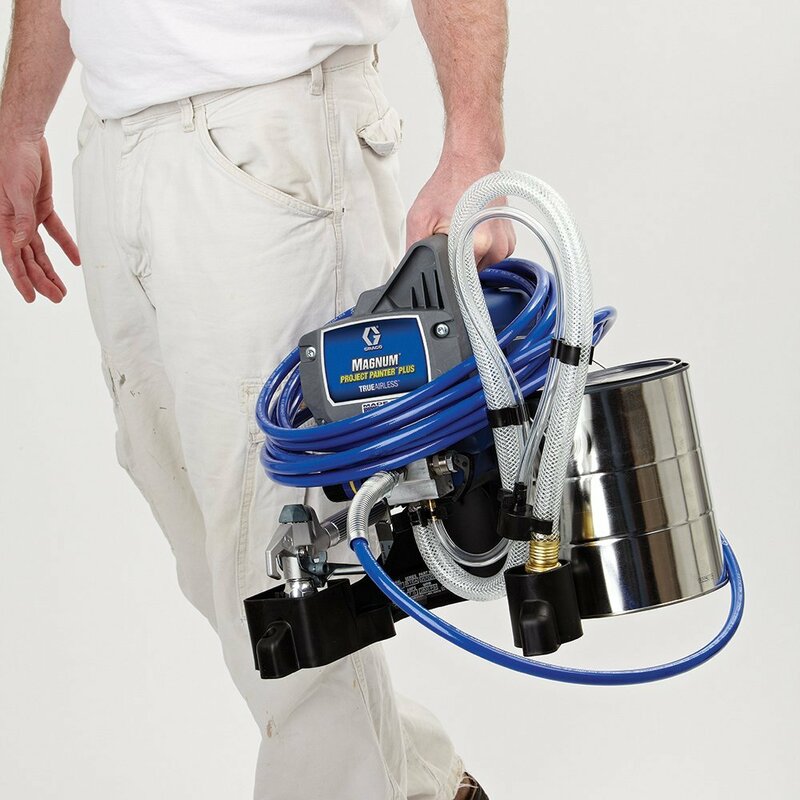 Couple the machine's 25-foot Duraflex airless hose and its compatibility with differently sized containers and you have a paint spray gun with a significantly broad coverage. The ingenious construction makes it an ideal choice for individuals looking for a little flexibility and productivity, allowing you the freedom of spraying a wide range of paints and compounds and other materials without many restrictions. Consequently, you'll be at liberty to use heavy latex paints, acrylics, wood stains, and several others and the spray gun will deliver exceptional results each time. Therefore, irrespective of the type of wood or the roughness or smoothness of the surface you intend to paint on, the machine has your back covered. If you’re spraying projects mostly involve stains and finishes, then the paint gun comes hugely recommended as this is one of the areas it excels. As far as ease of use and simplicity are concerned, it is the right paint spray gun to use if you want a hassle-free and straightforward operation. The fact that the paint spray gun comes with its internal compressor means there's no need connecting it to an external air supply. The unit is, therefore, an ideal choice for home painting jobs as it eliminates the need for storing or operating extra equipment to ensure the successful completion of a painting task. Another major selling point is that unlike the vast majority of paint spray guns out there, it doesn't require filling up a cup with your preferred paint. Directly connecting the gun to a paint can through a hose does the trick. And as already mentioned, a 25-foot hose is one of the accessories the unit comes with, so you don't have to go out to purchase one separately. The sheer length of the hose is yet another advantage. It considerably extends your reach, making it possible for you to move with ease from one spot to another without the need to continually refill a paint cut each time. Like the previous product, the design and engineering restricts it to light-duty painting projects around the house and is excellent for giving your ceiling, deck, and fence a fresh coat of paint. It's a versatile, high-performing, and easy to use unit with a smooth learning curve so it can be used by novices, Do-It-Yourselfers, and even expert painters. The unit's power supplies adequate power for spraying unthinned paint for exceptional coverage. The powerful suction tube is quite effective at directing different types of paint from either a 1- or 5-gallon paint bucket. If you're looking for a lightweight and therefore portable paint spray gun, the Graco Magnum 262800 X5 is the right product for you. The other additional features that makes it stand out from an otherwise crowded competition are the 1500W generator, Power Flush, and AutoPrime. These features make the paint spray gun one of the easiest to use, ensuring you finish your paint project in a fraction of the time it takes typical paint spray guns and achieves an excellent and enviable quality. The AutoPrime feature, for instance, comes handy for clearing your workstation of debris before and after you're done painting a surface. The Power Flush makes your work considerably easy by helping you with the cleaning process. All the while, you'll have an immense and uninterrupted power supply from the 1500 Watts generator, thereby going a long way in helping you become a productive and efficient painter with the Graco Magnum 262800. Plus, the pressure is fully adjustable, giving you the best control over the rate of paint flow. 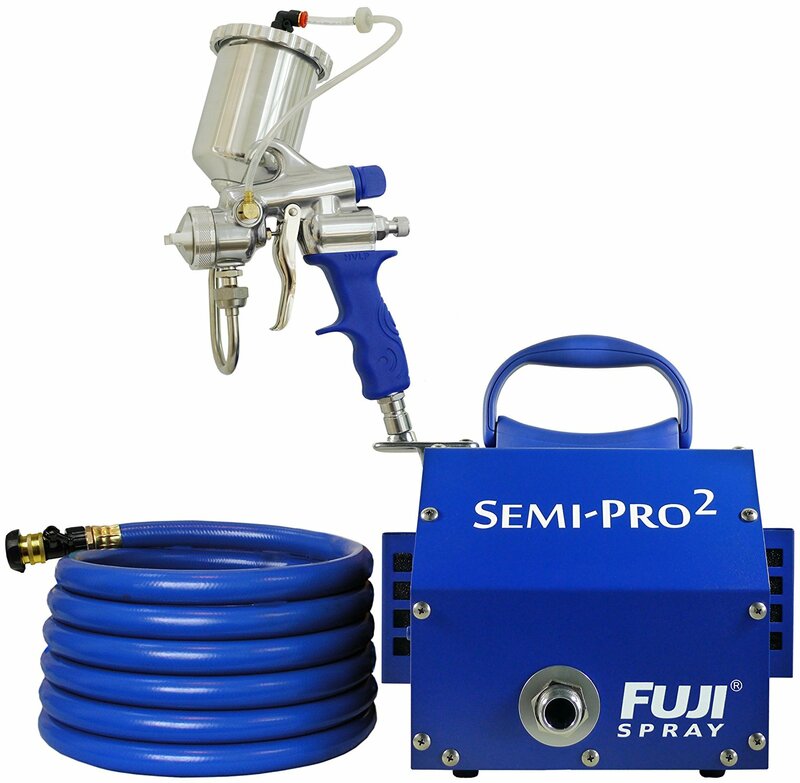 Very few sprayers can compare to this paint spray gun. The Wagner 0529010 Flexio 590 is one of the most flexible paint spray guns we've ever reviewed. The unit runs on the industry's latest technological discovery, the EZ Tilt Technology, which makes painting different surfaces with different paints at all angles imaginable a possibility. If you so choose, you could even turn the paint spray gun upside down, and its performance would not take a dip, not even slightly. It is an all-purpose paint spray gun, and its performance will be just as spectacular whether you decide to use it on light-duty, medium-duty, or heavy-duty painting projects. It’s built to take the abuse and heavy load thrown its way without giving the slightest indication of wear and tear. The inclusion of a twistable paint cup and X-Boost Turbine make it possible for you to quickly and efficiently complete the tasks at hand. The Wagner 0529010 came ready and prepared for the most demanding projects, and it will never disappoint. The unit sports comes with a GPH flow level of 8 which when combined with its specially designed dual tip makes even the most cumbersome and complicated projects easy, lasting just a fraction of the time it takes standard paint spray guns. Bring together the game-changing EZ Tilt Technology and the suction tube, and you have a paint spray gun whose performance completely overshadows and exceeds that of its closest rivals. Pairing the two gives the user additional control and manoeuvrability, allowing them to choose the direction in which to apply the paint. Consequently, you can achieve higher precision with the it than you can with other paint spray guns in its class. Another factor likely to influence your purchasing decision is the fact that the piston and the cylinder of this paint spray gun are constructed entirely out of Tungsten Carbide, a material renowned for its strength and ruggedness. The implication here is that with proper care and maintenance, you will continue using the Wagner 0529010 for a long time as it’s sturdy enough to withstand the pressure of every day heavy-use, whether that’s at a busy work site or around the house. It is no slouch when it comes to performance either. The gun’s ability to spray an endless stream of undiluted paint greatly endures it to a large section of the population who also like its fine finishing. The design accords you the freedom of adjusting the rate at which the paint flows depending on the size of your project and the time you have for a specific project. Deciding to go with a faster rate of flow will allow you to complete a massive project a lot faster and within a short time. However, the quality may suffer which makes it a less favourable choice for those looking for a high-quality finish. The ability to change the rate of flow also means that you can effortlessly and amply cover an 8 feet by 10 feet surface within a time span of between one and five minutes. Also, and this will be good if you're pressed for time and like a hassle-free operation, the Wagner 0529010 is capable of spraying a maximum of 8 gallon of paint every hour, which translates to fewer interruptions and higher productivity. In summary, the Wagner 0529010 is yet another high-performing yet pocket-friendly paint spray guns you can get on the market today. The fact that it comes from the Wagner brand means it’s as long-lasting as it is versatile enough for giving both indoor and outdoor surfaces a new and fresh coat of paint at a fraction of the time it takes typical guns. It comes with an adjustable control system as well as a dual nozzle option to give you greater control and manoeuvrability, allowing you to paint both horizontally and vertically. Because you can narrow or widen your pattern, the sprayer is a convenient and efficient unit to use all day long, and with little effort to boast. Plus, it features a reasonable and justified price tag. Very few paint spray guns are packed to the brim with impressive features like the Wagner 0518080 sprayer. 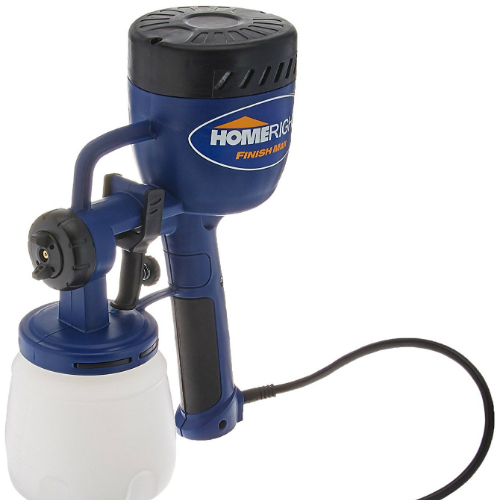 For beginners, the paint spray gun comes with a variable air pressure control allowing you to dictate the speed and efficiency with which you complete your painting projects. The ability to adjust and change the air pressure means you have greater control over the density at which the paint sticks to a particular surface, making it possible for one to preserve the pigment of thin materials by preventing excessive spraying. The unit also features the metal spray gun that completely upsets the industry, forcing the more established brands to rethink their designs in light of increased competition and increased shift of customer focus to the more innovative design. Couple the two features with the product’s long-lasting two-stage turbine and you have an all-purpose paint spray gun that perfectly meets all your painting needs, both in and around the house as well as on the busiest work sites. Another major highlight is its compatibility with a wide range of paint, the major ones being latex paint, lacquers, and stains. Consequently, you have a paint spray gun to use on different types of walls and surfaces, irrespective of the smoothness or roughness of their surfaces. If your deck, furniture, cabinets, touch-ups, ceiling, fence, inner and outer walls of your house need a fresh and new coating of paint, the Wagner 0518080, given its sturdy and long-lasting construction, needs to be your first and only resort. The paint spray gun happens to be an exceptionally easy to use the machine, requiring no technical knowledge about the working of paint guns, so any member of your family, whether a novice or an expert can pick it up and get it ready in a matter of seconds flat. The other features that make it one of the easiest to use paint spray guns are the inclusion of a Lock-n-Go front end, allowing for the hassle-free and effortless changing of materials whenever the need arises. The feature eliminates the need to use any special tools, which works to keep the cost of operating the system down and saves you the time and effort you'd have to spend otherwise. If you're looking for perfection or just prefer high-quality work, you'll be pleased to note that the Wagner 0518080 is fitted with two air filters, ensuring the finish has the protection it needs against dust and other workshop debris that would otherwise vitiate your work. You, therefore, end up with a clean and neat surface. Made by a customer-trusted brand whose commitment and dedication to the production of high-quality and functional products is renowned the world over, the sprayer is a perfect fit for individuals looking for a flexible and cost-effective paint spray gun. As far as versatility is concerned, very few paint spray guns can match it. To begin with, it gives you the freedom of choosing between three different spray patterns, depending on the type of paint you’re using, the surface you intend to paint and the speed at which you want to accomplish the entire project. Also included in the package is a 20-foot air hose allowing you to reach the furthest corners of your house or move relatively quickly from one extreme end of a warehouse or your place of work to the other without having to drag everything along with you. In all, the Wagner 0518080 is a lightweight and compact paint spray gun and aside from being very portable, also happens to be quite easy to use. The fact that it's light and compact makes it a perfect choice for enthusiastic Do-It-Yourselfers, professionals, and novices looking to paint tight spots around the house or other commercial buildings. It is equipped with a reliable compressor to provide you with a smooth and uninterrupted painting experience. There’s also a convenient 20-foot air hose that significantly helps with mobility so you can access different parts of the house without the need to drag the whole system with you. You can achieve some versatility easily adjusting the spray pattern so you spray horizontally, vertically, or in circular patterns. Setting up and cleaning the machine is quite easy and straightforward, plus it’s very pocket-friendly. Anyone who has ever painted a house manually using a roller can attest that the process is a labour-intensive and time-consuming endeavour, requiring days of preparation and there's no guarantee of precision. With technological advancements, however, you now have very functional, long-lasting and accurate paint spray guns at your disposal and you don't even have to break the banks to get one. The Fuji 2203G is one such machine, and in spite of its sturdy construction and the convenience that comes with owning it, it allows you to cut make significant financial savings. It eliminates the need for professional assistance when giving your decks, ceiling, fence, furniture or your walls a fresh coating. Aside from being cost-effective, the Fuji is similarly an energy saver. It offers you an ease of use and straightforward operation generally lacking in a vast majority of paint spray guns. You don't need any working knowledge of turbine systems to operate the machine. Bringing all the different components and parts together and getting it ready to paint takes a matter of minutes, or seconds depending on your familiarity with paint spray guns. If you a novice or just an enthusiastic Do-It-Yourselfer using a paint spray gun for the first time, it's highly recommended that you peruse thoroughly through the manual to gain some understanding on the working and specs of the spray system. Another feature that significantly bolsters the performance is its 400cc gravity paint container, strategically attached to the pistol. The gravity cup makes your work easy with its 400cc capacity capable of holding a great deal of paint so that you don't have to interrupt your own project now and then to refill. The sheer size also ensures you cover quite an expansive section of the surface you're painting before stopping for a refill. It does not require any complicated attachments like other typical paint spray guns. After a successful assembly, all that's remaining is to find a suitable surface and get to painting right away. The machine comes with a relatively long hose at 25-feet weighing just about 26 pounds and durably constructed to stand the test of time. With a length like that and its flexibility, you'll have an easy time spraying the hardest-to-reach parts of the house or the commercial building you intend to re-paint. It also comes in a lightweight and compact design so that you don't have any difficulties dragging the entire system from one place to another or transporting it in the trunk of your car, as it takes up considerably less storage space. The ergonomic design of the handle grip also prevents hand fatigue occasioned by using the machine for an extended period and aims at preventing the possibility of slippage, especially for those who'll be working in adverse weather conditions. The incorporation of an air control valve with the hose is a thoughtful decision, going a long way in preventing the production of too much overspray. The valve allows for the prompt termination of the process the soonest you stop squeezing the trigger, so there is an even coverage and elegance in the final product. 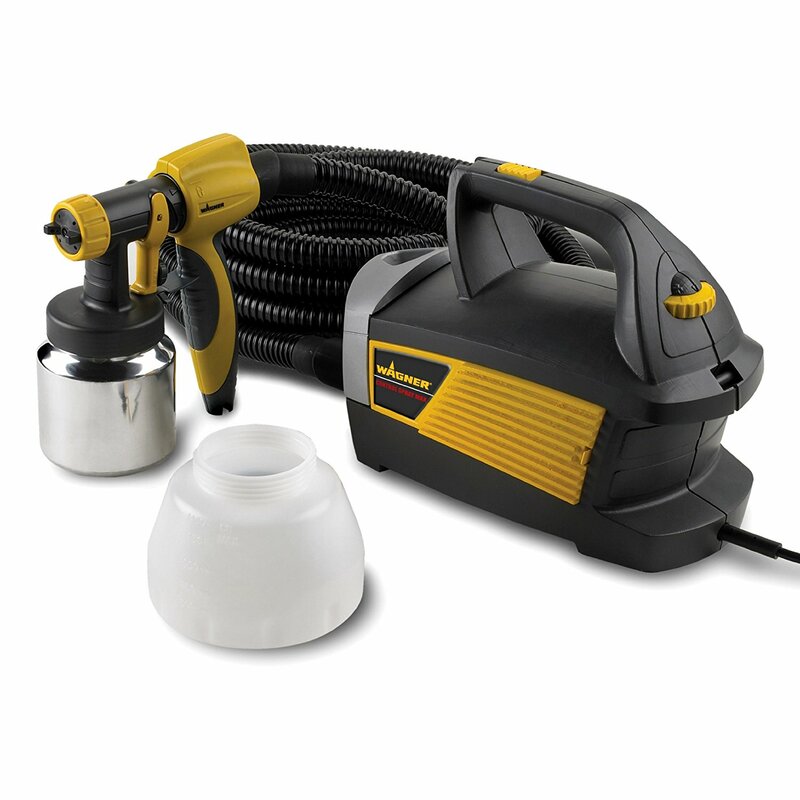 The spray system comes with a powerful 1400-Watt 2-Stage Bypass motor for efficiently handling thick or dense materials that include latex and acrylic, making it a suitable choice for light-duty to heavy-duty painting projects. While other standard paint spray guns are likely to struggle with such paints, they seem to be a piece of cake for this paint gun, a fact that endears it to a large percentage of novices and professional painters. The motor supplies sufficient power for effectively tackling all types of projects you throw at it. Like other paint spray guns, the Fuji 2203G Semi-PRO is fitted with a fan control knob for the easy changing of painting patterns so you can gradually shift from a small stream to a bigger one. The feature is not only time and labour-saving, but also increases precision by regulating the intensity of the paint on different surfaces. While this spray system leans a little on the noisy side, it easily offsets this drawback by offering you off-the-charts precision, durability, and reliable performance. It is a versatile tool with a powerful motor that effortlessly handles even the densest painting like latex and acrylic. The 25-foot long hose is equipped with a convenient air control valve for efficiently minimizing overspray thus ensuring an even coverage and elegant results. The design allows for quick and painless clean-up. With its 400cc paint container, you’ll be painting much faster over a large surface with very minimal interruptions. The unit is definitely a worthy investment for any serious professional painter, Do-It-Yourself enthusiast and novices just starting out on their hobby. Technological advancements have made a majority of household and commercial tasks an incredibly easy, time-saving and less labour-intensive endeavour, eliminating the need to make huge financial commitments in the process. 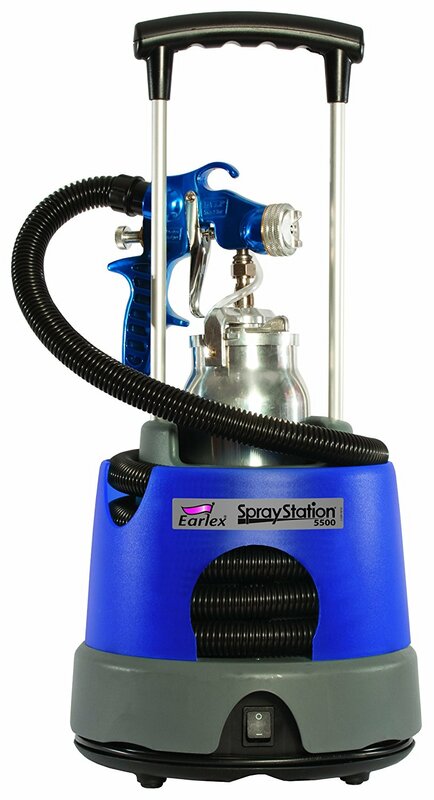 For any person seriously considering giving the walls, ceiling, cabinets, decks, and furniture in their house a fresh coat of painting or are intending to take on a huge painting project at their place of work, the Earlex HV05500 is a paint spray gun worth paying some considerable attention. Its simplicity makes it an ideal choice if you’re thinking of painting or straining on a frequent basis, as it gives you a hassle-free and straightforward operation devoid of all the mechanical and operational issues plaguing guns within its price range. It strikes the perfect balance between simplicity and versatility, allowing you to take on a wide range of painting tasks with different types of materials. 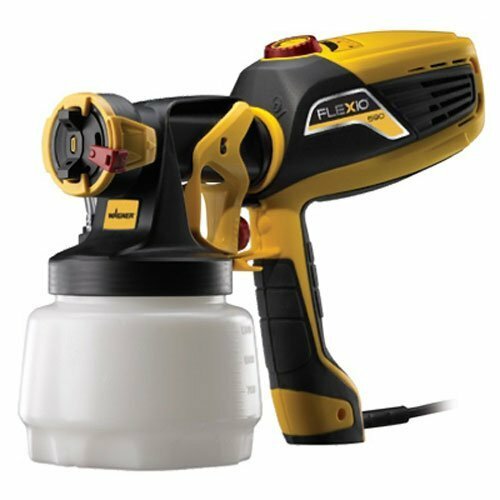 The paint spray gun can perfectly handle all types of paints ranging from the lighter urethanes to the denser latex, oil paints, enamels, varnishes, lacquers and even acrylics, thanks to the inclusion of a 650-Watts powerful turbine. Such flexibility and power allow for the completion of various tasks with just a single tool, which in turn saves you a great deal of money you would have otherwise spent on paint spray guns capable of handling the denser paint types. When it comes to performance, you know you the Earlex HV05500 Spray Station can never disappoint. Its design allows for effortless and quick adjustment of the spray patterns using the control dials to match your needs. You can choose settings that best prevents the wastage of paints – from round, vertical and horizontal - while accelerating the painting process, guaranteeing that you finish in a fraction of the time it takes standard paint spray guns and with less effort. As far as portability goes, it is both lightweight and compact, thereby allowing for its easy transportation from one place to another. Neither will you have any difficulties hauling it around the house or on the construction site, risking the safety of your hands in the process. It’s equipped with a useful and convenient long carry handle for carrying or moving it with ease. Its compactness makes it possible for you to keep it in the trunk of your car and still end up with enough space to store other hand and power tools. And when you’re done painting with the spray station, keep it in a safe, cool and dry corner of the garage together with its accompanying accessories like the hoses and power cord. Collective storage, for one, allows for easy retrieval whenever the need arises in addition to limiting the likelihood of integral parts getting misplaced or lost. The ergonomic design of the unit also eliminates hand fatigue and prevents the development of blisters or staining of the hands so you can continue working for hours on end to complete your project on time. One of the main highlights of the paint spray gun is its incorporation of the game-changing Push-n-Click type of design. The features eliminate the need for difficult to use knobs and dials, allowing even the most clueless novices to set a specific spray pattern of their choice simply. The power and efficiency of the Earlex HV05500 mean you be able to finish all your painting projects, both lightweight and heavy-duty in a quick and high-quality fashion and with incredible precision. Moreover, the ability of the paint spray gun's ability to produce a maximum of 42 cubic feet per minute of air volume allows you to cover all the surfaces without risking any overspray consistently. 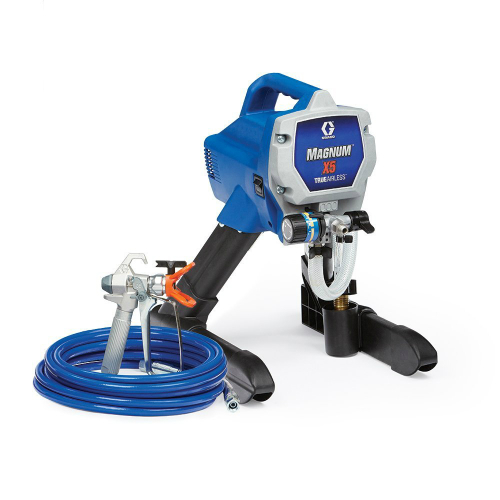 The design and engineering of the Graco Magnum 26805 X7 HiBoy makes it a multi-purpose paint spray gun that fully meets all the painting needs of Do-It-Yourselfers, handymen, carpenters, renovators, and even remodelling contractors. 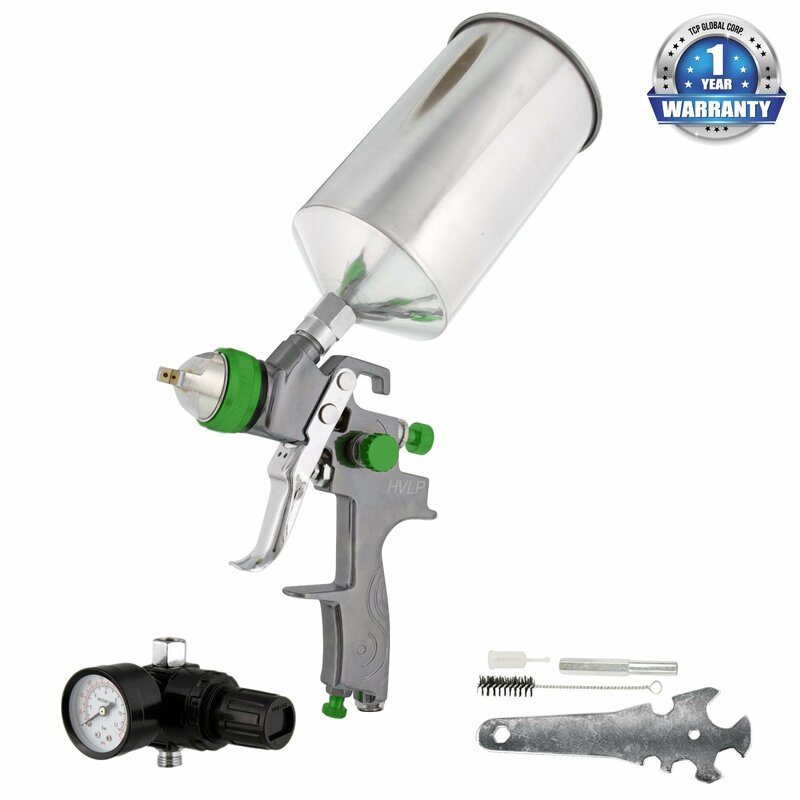 The paint spray gun is bundled with all the accessories you need to get to work literally the minute you receive your package, considering that its simplicity and ease-of-use keeps all final fine-tuning to a bare minimum. As many previous and current users have observed and so articulately point out, the paint spray gun is a product of professionals’ ingenuity, and is meant for use by other professionals in the industry. The product is feature-rich and will be of great help taking on the most challenging and complex painting projects, both light-duty and heavy-duty, and guarantee that you complete the said projects quickly and efficiently. Speaking of efficiency, it is largely unmatched. Efficiency helps you make significant financial saving by preventing the wastage of material, time and even labour and simplifies the tasks you’re undertaking, making sure that you finish without making any errors. These are the advantages that it provides you. For instance, it has a considerably long 100-foot connection hose to give you further reach into the most hard-to-reach and far-flung sections of the house like the basements and the shutters. The length of the hose eliminates the cumbersomeness of having to drag or haul the entire system with you as you paint. Couple the extra-long connection hose with the larger spray head and you have a paint spray gun that allows for a much wider fanning, guaranteeing that you finish your project in a fraction of the time it takes standard paint spray guns. The one feature that appeals to the mainstream of painters out there the fact that the design allows you to easily adjust the pressure, thereby giving you greater control over the rate and speed of its flow. Consequently, you can choose a slower or faster rate, depending on the type of paint, the extent of the surface you intend to spray over, and the time you have allocated to the project, among other factors. The other critical inclusion is the Flexible Suction Tube that works perfectly well when connected directly to a 1- or 5-gallon paint bucket. A major highlight is its powerful motor generating about 3000 PSI that makes it incredibly easy for you to work with denser types of paint such as heavy latex, stains, oil paints, enamels, varnishes, lacquers and even acrylics. With this in mind, you may be a little worried about the other critical issue of portability seeing as sometimes the machine can get incredibly heavy. However, you'll be pleased to learn that the Graco Magnum brand offers the machine with a convenient carrying cart for easy wheeling from one spot to another around the house or the job site. The base wheels are sturdy and capable of withstanding a broad range of surfaces, even the most even and rough. For greater productivity, you still have the hose to help you access tight sports. The Graco Magnum 26805 is also constructed with convenience in mind. Understanding that all painters, whether novices, enthusiastic Do-It-Yourselfers or expert painters, would like to keep their workstation clean after a painting job, the paint spray gun is equipped with a Graco Power Flush System to assist in the process. The features help you clear off all the dirt and mess made while painting in addition to ensuring that the spray gun is in an optimal performance condition and ready for the next painting task. To this end, the feature allows for quick and efficient cleaning. Simply connecting the unit to any standard garden hose allows water to quickly and efficiently start flushing out all the dirt and debris, leaving it clean and in top-notch condition. The other premium feature it packs worth paying serious attention to is the tilting tube, which is a standard feature in all paint spray guns offered by the Graco brand. The feature guarantees the paint will continue to flow even after you to tilt the gun to various angles while manoeuvring through tight spots. The unit comes with a tough and rugged piston made from stainless steel capable of handling approximately 125 gallons of paint on a yearly basis. The sturdy construction of the pistons also considerably extends the shelf-life of the motor while ensuring they continue working at peak. From our review, it’s clear the Graco Magnum 26805 is a paint spray gun for homeowners and professionals handling light-duty to medium-duty projects, even though it can be used for heavy-duty work on occasion. It comes in a lightweight and compact design, which makes it easy to manoeuver while offering you simple and straightforward operation. With all its premium features and top-notch performance, it is without worth investing in for the long term. If you want another feature-rich paint spray gun fit for a multitude of spraying tasks around the house and on the work site, take a closer look at the Neiko 31215A. Aside from its heavy-duty construction and ruggedness, the paint spray gun is stunningly versatile, and will expertly handle all types of workloads you throw at it. The use of steel as the primary construction material for the product is advantageous in several ways. To begin with, steel is an ultra-strong, durable and lightweight material that will significantly prolong the unit’s shelf-life. Additionally, the steel, specifically the type used in the construction of the nozzle, is resistant both to rust and corrosion, thereby minimizing the possibility of oxidation. Another crucial part that features robust and heavy-duty construction is the cap, constructed purely out of solid brass which subsequently works by improving the longevity of the paint spray gun. Capable of withstanding a working pressure of 10 Pounds per Square Inch, an operating pressure of 40 Pounds per Square Inch, and about 4.5 Cubic Per Feet Minute. With readings like these, it’s not hard to see why the Neiko 31215A is considered a top-performer beating some of the premium guns on this list in some important aspects. The manufacturers opted for the more efficient and easy-to-use gravity feed design giving the gun a sophisticated and modern-look appearance, thereby appealing to a majority of handymen, Do-It-Yourselfers, and enthusiastic painters. The design also makes the Neiko 31215A HVLP Gravity Feed Air Spray Gun the best paint spray gun to use to give your ceiling, decks, fence, and furniture and inner and outer walls a new coat of fresh paint. The gun’s compatibility with three adjustable valve dials also makes it a people’s favourite as is give you extra control and manoeuvrability you need for precise and efficient paining of different surfaces. So precise is the spray gun that the possibility of painting outside of your target area or surface is literally non-existent. The gun has spectacular atomization capabilities achieved through the combination of pressured air, released by the air compressor, with the paint of your choice. The process leads to a smooth, tidy and clean coat on all types of surfaces. In case you're wondering, the paint is held in a 600cc cup strategically fitted at the top of the machine, so gravity keeps the contents automatically flowing into the spray chamber for it to be atomized. The absence of a complex and sometimes cumbersome mechanism of pulling the paint into the spray chamber gives you extra efficiency and control over the process of spraying. The large capacity of the cup minimizes interruptions, allowing you to paint up a significant surface area before requiring a refill. 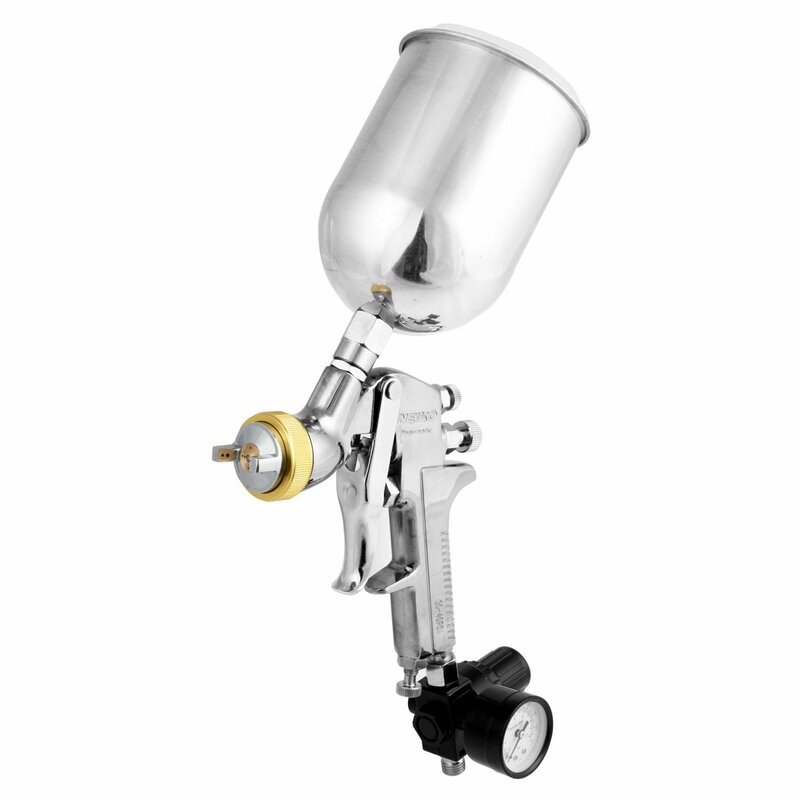 As already mentioned, this spray gun is an all-around paint spray gun and can handle a wide range of paints, both heavy and light, as well as surfaces effortlessly and efficiently. Because of its 17 millimetre thick nozzle, the gun experiences no difficulties whatsoever handling primer and metallic basecoats in addition to several other automotive and domestic painting tasks. Some of the accessories it comes with include a wrench, a 600cc aluminium cup equipped with a lid, a handy brush for clearing the mess and dirt generated during painting, and lastly an air gauge. All these accessories lend credence to our earlier assertion that the gun is a multi-purpose unit, featuring a heavy-duty construction and boasting the advantage of being compatible with different types of paints. Overall, the Neiko 31215A is a high-volume spray gun coming with a pocket-friendly price and an ease-of-use and an exceptionally high performance most likely to appeal to the mainstream of enthusiastic hobbyists, extreme Do-It-Yourselfers, and even expert painters all over the world. The versatility of the gun makes it compatible with a broad array of paints and materials including but not limited to heavy latex, acrylics, and other water- and oil-based paints widely available on the market. 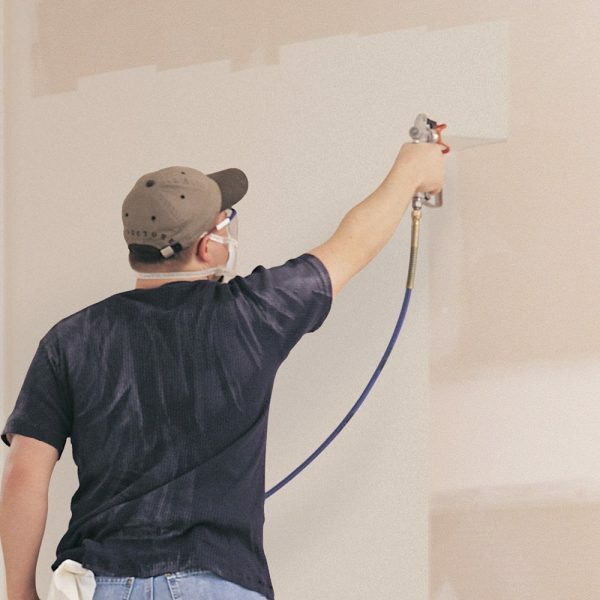 The gun's ability to consume averagely 4.5 cubic feet per minutes of air volume makes it the best for undertaking all types of indoor and outdoor painting projects, from light-duty to heavy-duty. At its level of precision, it is a great steal. The TCP Global Brand HVLP Spray Gun is for those novices, DIYers and expert painters who want to experience a hassle-free and simple painting. The set comes with a comprehensive collection of all the accessories and tools you need to make for spray-painting, eliminating the need to go out of your way to get any additional tools, at an additional cost no less. It is a complete set and as such you get three guns - the first optimized for primer coating, the second ideal for topcoat painting and the last perfect for touch-ups. There are two cups with a total capacity of one litre, another cup made from stainless steel and with a carrying capacity of 150cc, and a regulator for controlling air pressure equipped with a useful locking mechanism for efficient control. The other smaller but equally critical accessories in the kit are a mini moisture filter, a kit for cleaning, two wrenches, and a brush. The guns are factory-equipped with heavy-duty needles and a nozzle, also made from stainless steel to make sure the spray gun continues providing you with reliable and exceptional performance for the next several years. This exhaustive list sounds a little daunting and may have gotten you a little worried, wondering which accessory is for which purpose. The TCP Global Brand has thoughtfully included an instructions manual in the set, containing very clear instructions to guide you on how to set up the spray gun and get it running. Aside from the accessories, the kit also contains a 12-month warranty to cover for the costs of repair and replacement of components and accessories that malfunction as a result of the manufacturer’s use of low-quality materials or poor workmanship. The warranty should give you a peace of mind, so you work peacefully for as long as you want. It is a feature-rich unit, and all the features work towards one aim: ensuring the design works efficiently thereby allowing for effective painting in a fraction of the time it takes standard paint spray guns. For instance, the paint spray gun is equipped with three fully adjustable knobs for changing the spray patterns in accordance with the type of paint you are using and the vastness of the surface you intend to paint over. The knobs additionally allow you to control other significant aspects like the air pressure and the flow of fluid. The inclusion of 0.25-inch air inlets allow for the free circulation of air throughout the unit ensuring your coat is not only smooth but also even. Despite coming 9th on this list, the TCP Global Brand HVLP offers you powerful and dependable performance every day, all year round. Its operating pressure ranges from a low of 29 Pounds per Square Inch and a maximum of 50 Pounds per Square Inch and a corresponding cubic feet per minute of between 3.5 and 7.1. Looking at these statistics, it's hardly a surprise it so efficiently and effortlessly works with some of the densest or heaviest paints on the market like latex and acrylics. The air pressure requirements of this paint spray gun are pretty much within reach of its air compressor meaning you won't have to take unscheduled breaks now and then waiting for the unit to keep up. This translates to a shorter finish time and greater efficiency and productivity for you. In a nutshell, the spray gun provides you with additional capabilities that go beyond just sprucing up the appearance of your ceiling, decks, furniture, and walls. Its design makes it similarly ideal for automotive painting considering that it comes with separate spray guns all of which are compatible with standard air compressors. The design makes it a perfect choice for laying down primer, spraying your preferred colour, applying a topcoat before finishing off by touching up your project, so it's as precise as you want. Plus, you get all the necessary accessories to allow for efficient painting at no extra cost. If your heart is set on a high-performing, durable, and versatile paint spray gun, it should be your first and only consideration. If you are an enthusiastic Do-It-Yourselfer, a novice just started with their painting hobby, or an expert painter looking for the perfect paint spray gun to use on heavy-duty and large-scale projects, look no further than the Graco 257025. The sprayer ticks all the right boxes from performance, rugged and durable construction, flexibility, ease of use, and even simplicity. For instance, the gun is equipped with an SG2 metal spray gun with tip guard that easily houses paints ranging anywhere between one and five gallons. The compatibility of the flexible suction tube with a 5-gallon paint container means you can work for hours on end with very few interruptions, so you complete your project efficiently and much quicker. Unlike other paint spray guns in its class, the 257025 has this complicated look that may discourage novices from giving it serious attention, fearing that it lacks the simplicity claimed by the manufacturers. Contrary to such expectations, the sprayer, in fact, offers you a simple and straightforward operation. It takes no more than three minutes to set it up and have it ready to paint. Plus, there is a comprehensive instruction manual written in very clear and concise language to guide you through all the assembly steps. Some of the accessories are a 25-foot long hose, a 515 RAC IV tip, and pail hook. These accessories go a long way in increasing your convenience, ensuring you finish your painting project without the hassle and bustle associated with a low model sprayer. The 25-foot hose, for instance, allows you to move around a room or work site without the need to drag the entire system along with you. The hose similarly gives you additional control and manoeuvrability, so you have easy access to tight and hard-to-reach spots. The 515 RAC IV tip is for ensuring that the sprayer is compatible with a wide range of paints, from the lighter ones that pose no difficulties to spray to the denser and heavier varieties like latex, oil paints, enamels, varnishes, lacquers and even acrylics. It has a stainless steel piston pump allowing for the expert handling of unthinned paints at very impressive pressure levels. Combine this with its knack for producing a broad range of even coats, and you see why it's the best paint spray gun for interior tasks, decks, furniture, sheds, fences and other smaller objects both at the domestic level and on the work site. The pail hook, on the hand, is for easing the process of moving the workstation with the whole structure, thereby guaranteeing you effortless and ample painting. There's also an additional cleaning adapter for removing any maintenance problems and the emulsion supply hose for guaranteeing you exceptional versatility throughout the process. Only a handful of premium sprayers offer you the reliability and control of the Graco Magnum 257025. The sprayer makes it possible for you to do your spraying in a way you find most convenient, thanks to its fully adjustable pressure setting located on the machine’s paint head. Consequently, you are accorded the freedom of choosing a speed at which the paint flows and fine-tune it to match the type of job you’re undertaking. In a nutshell, the Graco Magnum 257025 gives you the ultimate level of control and flexibility by allowing you to adjust so you conveniently match the rate of paint flow with the nature of painting job at hand. Its versatility makes it an indispensable tool for carrying out a broad range of domestic and commercial building improvement and renovation and works best with such surfaces as decks, cabinets, ceilings, and fences among others. The long hose allows you to move freely and unhindered around the job site without having to drag the entire system with you, in addition to giving you greater access to tight and hard-to-reach spots around the house. With its heavy duty and durable nozzle, you can paint in all sorts of angles, whether vertically, horizontally or roundly and there won't be any performance repercussions. It is a helpful, high-performing and long-lasting machine, plus it’s reasonably priced. It’s worth every penny you’ll be paying for it. The size of a paint spray gun’s tip can mean the difference between a high-quality coating and less-than-satisfactory results. While a large percentage of paint spray guns are compatible with a wide variety of tip sizes, there is similarly a percentage that is designed to work with just a particular size, which can have adverse implications for your project if you frequently alternate between large surface and detail-oriented painting projects. As you may already know by now, the uniform and efficient application of thick paints such as latex and acrylics necessitate the use of a considerably large tip while lighter paints like stain need small tips to achieve the same results. Tip sizes additionally relate to spray patterns and the general rule is that the wider the spray pattern, the larger will be your coverage. Different paint spray guns have hoses of more extensive lengths with a typical one falling with the range of 25 feet. A long hose allows you to move around the house or work site with a lot of freedom and with very few restrictions, thereby eliminating the frustration of having to haul or drag the entire system with you as you progress. With a 25-foot hose, you’ll have more time to paint a house with minimal distractions. Long hoses also permit you to access those tight or hard-to-reach spots around the house, ensuring you cover every inch of the house. You may also want to pay attention to portability while we’re on the issue of hoses. Depending on the type of paint you decide to use and the nature of the painting job, portability can become an issue. At some point, you’ll have to move the whole system comprising of the paint supply and the painter to a several positions or locations during the painting process and maybe over a long distance. To make your work easier, consider getting a system fitted with durable and heavy-duty wheels, so you have an easy time moving it over different terrains. If you need high performance, there’re a couple of pointers you’ll have to pay attention to, one being the pressure control. Paint spray guns equipped with pressure control depreciate a lot slower than their non-adjustable counterparts. The ability to choose a specific setting such as low or high, tends to enhance the results you get, in addition to saving you a significant amount of money by limiting mechanical issues, which in turn prolong the machine’s shelf-life. Also, keep in mind that powerful guns increase efficiency while saving you the effort and time. As a result, make a point of getting a unit with higher CFM (Cubic Feet per Minute) and PSI (Pressure per Square Inch), that is if you need that kind of power, as it translates to better results when painting your furniture, decks, fence, ceiling, or walls. Even though cost is a negligible consideration, it is nonetheless a crucial one because you don’t want to buy a premium paint spray gun only to use it once every other month. If you’re working on a budget, compare and contrast all the products falling within your price array, so you’re able to pick one with most of the features you need. Also, keep in mind that the general perception that the price of a product is a reflection of its functionality, design, performance, and quality of construction. While such an observation has some merit, it doesn’t hold true for all products. Products with big brand names tend to cost more even though their performance is sometimes on par with those from lesser-known manufacturers. Q: What is the difference between high volume low pressure spray guns and airless spray guns? A: High Volume Low Pressure spray guns, known as the HVLC guns for short, are the traditional variations capable of delivering a substantial amount of paint at correspondingly low pressure. The design leads to a further reduction in air volume thereby allowing for a more uniform flow of the paint which in turn limits the likelihood of over-spray. Airless spray guns, on the other hand, have a completely different design. They have substantially high pressure for efficiently pushing paint or fluid through a specially-designed atomized nozzle. From the nozzle, the paint suddenly reaches an area of considerably low pressure. The pressure variation triggers slow atomization that is perfect for covering expansive surfaces requiring heavy coating. Q: I am considering buying a paint spray gun. What are its advantages over using a brush or better yet a roller? A: Paint spray guns, whether airless or HVLP, have several notable advantages over brushes and rollers, the first and most obvious of which is speed. The design of the sprayers automates the painting process allowing you to cover large areas or surfaces in a fraction of the time it takes brushes and rollers. Because of their sizes and power, they can also access tight and hidden spots around the house or work site, guaranteeing an even distribution of paint to every inch of a surface. Secondly, paint spray guns use considerably less paint since the possibility of over-spray paint accumulation is significantly limited, making them the more efficient choice. After all is said and done, searching for that one, suitable paint spray gun can turn out to be a daunting, laborious, and time-consuming exercise, especially if you’re oblivious of the factors and features to look out for. Narrowing your search to a couple of guns and going a step to refine your search even further until you end up with the best unit requires understanding your needs first. All the units featured on our list meet and even exceed the standards set by several international certifying bodies, plus they all come from established brands with several years of experience, expertise, and the requisite knowledge. The best one is one that’s versatile enough to take on a plethora of tasks with their flexible spray patterns. The products feature industrial-grade construction and will provide you several years of high and reliable performance. Whether you intend to undertake a light-duty or heavy-duty painting tasks, whether at home or on the work site, our list has you covered.